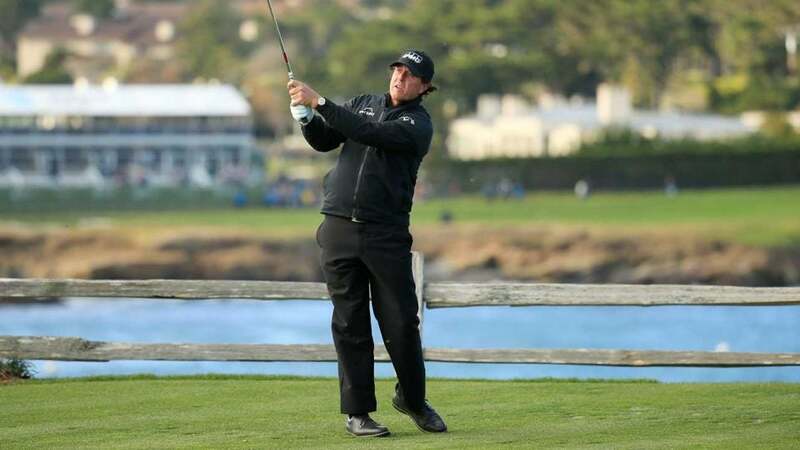 Phil Mickelson faced quite the deficit when he began playing Sunday morning. To make matters worse, Pebble Beach saw its wildest weather in years. But then the tournament took quite the competitive turn. Here's what you missed on the PGA Tour this weekend. Who won: Phil Mickelson (seven-under 69, 19 under overall) How it happened: Mickelson began Sunday's round in the final pairing, but trailed Paul Casey by three strokes. The 48-year-old wasn't going to be handed the trophy; he'd have to earn it. Mickelson was bogey-free, catching Casey after a birdie on the 10th and extending his lead when Casey made bogey on the 12th and 13th. Wild weather from the morning kept the final pairing from finishing, so Casey and Mickelson headed back out to Pebble Monday morning. Casey made the three-foot putt that awaited him on the 16th green and both players tossed solid approaches inside of 10 feet on the 17th. Both players missed their birdie tries, though. On to 18, where Mickelson's three-shot lead was just too much. Lefty took an iron off the tee, reached the green in three. Casey made birdie on 18 but so did Mickelson. Why it matters: The win is Mickelson's 44th in his PGA Tour career, good for ninth-best in history. Remember when he won in Mexico last year and said he'd win 50 times in his career? Well, he's one step closer to that Toal now. Best use of Tour rules: Mickelson was in a rush to finish Sunday night as the sun set quickly. "I can see just fine," he said. Casey disagreed. The Englishman said he'd rather call it quits for the day and return Monday morning. That's all the Tour needed to make a call. Best quote: "I'm a Sun Devil. I like the sun," Casey said of the conditions. "This is brutal. This is why I moved away from England." Best job making good of the conditions: Pebble Beach saw a wild hail storm early Sunday, delaying the final round and blanketing the course in icy chunks. No problem for Sam Saunders, though, who decided to have a little fun. Up next: The Tour heads to SoCal for the Genesis Open at Riviera Country Club. Tiger Woods plays host in his second official event of 2019. Bubba Watson is your defending champ, while a bunch of other big names (Rory McIlroy, Justin Thomas, Dustin Johnson) populate the field.